Located at the southern edge of the Sahara Desert and six miles north of the Niger River in the present-day nation of Mali, Timbuktu has been a centuries-old, significant city in West Africa. In the 14th Century it became the commercial, religious and cultural center of the West African empires of Mali and Songhai. With its population of traders, merchants and scholars, Timbuktu was known throughout western Africa and its fame extended to Europe and Asia. Timbuktu is best known for its famous Djinguereber Mosque and prestigious Sankore University, both of which were established in the early 1300s under the reign of the Mali Empire, most famous ruler, Mansa Musa. Timbuktu’s founding dates back to the eleventh century when Tuareg nomads settled there and began using the site as a trading post of goods such as gold, ivory and salt along the Trans-Saharan caravan routes. 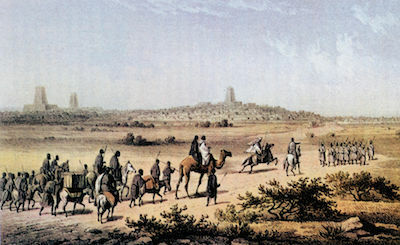 The city’s location near the Niger River facilitated trade across West Africa as well as with Morocco in North Africa. By the early 1300s Timbuktu had become the hub of a number of east-west and north-south trading routes and soon became the major commercial city (but not the capital) of the Mali Empire. Timbuktu’s population, which included Berbers, Arabs and Jews along with Mande and Fulani people from the surrounding countryside, was estimated to be close to 250,000 at the height of its prominence in the 15th Century, making it at the time one of the world’s largest cities. Timbuktu’s wealth was made evident to the world with the pilgrimage of Malian Emperor Mansa Musa to Mecca in 1324. Upon his return to Mali, Mansa Musa brought a number of Arab immigrants including the renowned architect, Ishaq El Teudjin, who built its legendary mosque, Djinguereber. The mosque served as a Friday prayer temple for thousands of inhabitants and its library and Sankore University attracted scholars from throughout the Muslim world. With an estimated enrollment of twenty five thousand students, Timbuktu had become the headquarters of Islamic intellectual development in Africa. Timbuktu’s greatest contribution to Islam and world civilization was its scholarship. By the 14th Century important books were written and copied in Timbuktu. Also, thousands of manuscripts written in Arabic were deposited in Sankore University including Tarikh al-Fettach, written by Mahmoud Kati in the 16th Century and Tarikh al-Sudan authored by Abderrahman es-Sadi in the 17th Century. Beginning in 1970 more than 18,000 of these manuscripts have been collected and preserved by the Ahmed Baba Institute (in cooperation with UNESCO) in modern Mali. In 1468, Mali was conquered by Songhai and Timbuktu came under the rule of Sonni Ali Ber and his more famous successor, Askia Mohammed Toure. Emperor Toure eventually made Songhai the largest state in African history with Timbuktu as its capital. In 1591 the Songhai Empire fell to the Moroccans. Under their rule Timbuktu lost its status as a major cultural and trading center. The Moroccans were driven out by the beginning of the 17th Century and Timbuktu was ruled by smaller states which were never able to reestablish its former glory. In 1894 French colonial forces seized Timbuktu. French control of the city continued until September 20, 1960 when Timbuktu became part of the newly independent Republic of Mali. Eric S. Ross, “Timbuktu.” New Encyclopedia of Africa. Ed. John Middleton and Joseph C. Miller. 5 vols. New York: Scribner’s, 2008; “History of Timbuktu.” Timbuktu Educational Foundation. 2002. 3 June 2008 http://www.timbuktufoundation.org/history.html.